Kirori Singh Bainsla said the reason he is joining the saffron party is because he is inspired by PM Narendra Modi's working style. Gurjar quota agitation leader Kirori Singh Bainsla on Wednesday joined the BJP, giving a boost to the saffron party’s efforts to win over influential leaders in Rajasthan where it had lost assembly polls. 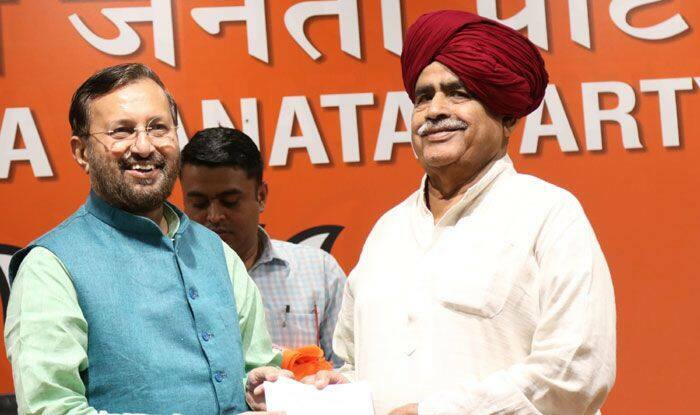 Bainsla and his son Vijay Bainsla met BJP president Amit Shah and announced their decision to join the party at a press conference in the presence of Union minister Prakash Javadekar, who is handling his party’s election affairs in the western state. “I have seen rarest of rare qualities in Prime Minister Narendra Modi and that’s why I am joining the BJP. The country needs his leadership,” Kirori Singh Bainsla said, adding that he is inspired by Modi’s working style. Recently, Jat leader Hanuman Beniwal had also joined the BJP and merged his regional party with it. The BJP has fielded him from Nagaur. The BJP is considering fielding Bainsla or his son from a Lok Sabha seat, sources said. Bainsla said he has been close to chief ministers of both parties — the BJP and the Congress — and had seen their ideologies. “After seeing two parties closely, I am joining the BJP,” he said. Javadekar said with each passing day, the BJP is emerging stronger in Rajasthan and win all 25 Lok Sabha seats. Bainsla was earlier in the BJP as well and had fought the 2009 Lok Sabha polls on its ticket but lost. He has been spearheading the quota agitation. The BJP had won all 25 seats in the 2014 general election. However, its defeat in the assembly polls raised questions as to whether the party will be able to put up a strong show in the state in the coming elections.